This is Part two of How to Find Free Camps in Australia. In part one we looked at places where you might just find a spot to camp for a night or two, in this the second part we take a look at some places to avoid and some security and safety issue. As always, feedback and comments are very welcome! In our experience there are a few places to avoid when attempting to camp. In the vicinity or within sight of a caravan park or paid area. This just invites trouble. Near schools – apart from being one of the noisiest places on the planet, people are especially vigilant and suspicious of vehicles parked near schools. Outside or within view of houses. In some places you simply get ignored (I think everyone just assumes you are visiting someone nearby) – but parking outside a home with a million dollar view of the sea will get you moved on for sure. Close to any military or secure area. These places have security patrols and you will get a midnight knock on the door every time. Close to hotels and clubs on Friday and Saturday nights. People often emerge intoxicated from these places. Groups of inebriated youths will occasionally be problematic. We have never felt threatened or unsafe when free camping or overnight stopping. I think this is in part due to the size of our bus – it is large, the windows are all tinted and it just looks threatening. 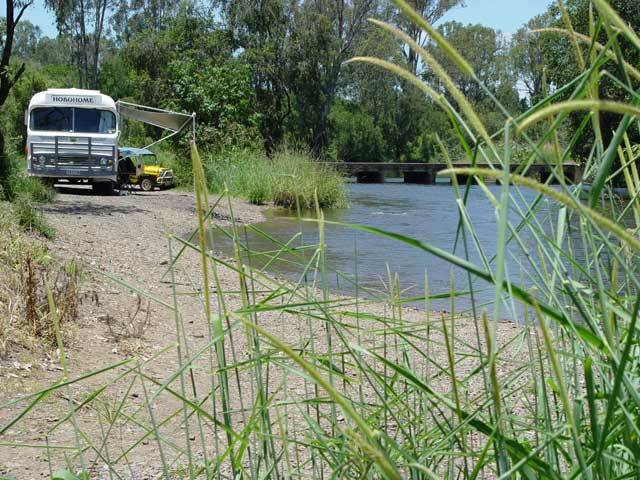 We have met quite a few people who simply can’t believe that we camp away from the “security” of a caravan park. We believe that in general, Australia is still a safe place and with a few simple precautions you generally have no security issues. We always park with a direct way out and if possible in such a way as to require two vehicles to block our exit. We use total blackout curtains in the motorhome and I regularly take a walk around the motorhome at night to check for escaping light that advertises our location to passers by. We have a security screen on the outside of our main door that allows me to talk to people without exposing myself to any danger. We are always ready to leave if we are parked in some place that we feel may be an issue. Leaving is always our first response in the case of an issue. We have been visited by security people and police in the middle of the night – our response is planned and always the same… We are always polite and quite prepared to move if we are causing any issues. This cooperative attitude has almost always served us extremely well. Most people (police included) are happy to allow us to stay until the morning when they see that we are not causing any trouble and not making a mess. Some authorities will even suggest other places that camping is permitted, tolerated or not patrolled. Be considerate, think about how you would feel if somebody tried to park their motorhome right outside your holiday home. Consider other campers. If there are others there don’t have loud music or noisy generators running for hours at a time. Just because there is no authority at the site does not mean that common courtesy should not be shown to others. Prepare your vehicle – make sure it has all the necessary equipment to allow you to stay in places with few or no facilities (see article on setting up your motorhome for free camping). Try to leave the site in better condition that when you arrived. Even if you did not drop the rubbish, someone arriving on the site after you will assume that you did. We always clean up any rubbish as soon as we arrive at a camp site. Plan ahead. Don’t try looking for a camp site at sun down – if you are not sure where you are going or where you are going to stay – start looking early. New campsites can be a nightmare of hazards at night. This entry was posted on Friday, January 8th, 2010 at 7:27 pm	and is filed under Caravan, Motorhome. You can follow any responses to this entry through the RSS 2.0 feed. You can leave a response, or trackback from your own site. Good Article and valid advice enven for the USA. One thing good about her for free campers is the ability to park at any one of the millions of Walmarts we have in the US for free. Hi thanks for your great and helpful articles . We have just set of after completing the,” Building your Motorhome” series sponsored by Honda and Waeco. 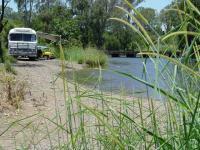 Our vehicle is a toyota coaster and we also plan to free camp everywhere, currently we are at Woodford QLD. and would appreciate any tips between here and Agnes waters. It has been quite a while since we have been in that pat of the country. The great west has been our domain for some time but currently heading east (will be on the Gibb River Road today – hope the bus handles it ok). Calliope River camp is really nice – I think it is in the camps book. Hope to catch up some time for a beer!